Groundbreaking X-Fi Sonic Carrier Reached Many Significant Upgrade Milestones Since Stealing The Thunder at CES 2016 and Now Includes SuperWide X-Fi™ - A Revolutionary New Technology You Have to Hear to Believe! LAS VEGAS, Jan. 3, 2017 /PRNewswire/ -- Creative Technology Ltd today announced that it would be showcasing the final production model of its well-received X-Fi Sonic Carrier at CES 2017. When the X-Fi Sonic Carrier first prototype was unveiled last year it stole the thunder at CES. Now at CES 2017, the much awaited final (and much improved) production model of the X-Fi Sonic Carrier is here. It's a dream product for those looking to experience the state-of-the-art in home audio. It's a new way to enjoy the best of both worlds in high-end audio and home cinema. The X-Fi Sonic Carrier will change the home entertainment landscape forever. Comprised of a main unit and a subwoofer, the X-Fi Sonic Carrier is a 17-driver system in an 11.2.4 speaker configuration. 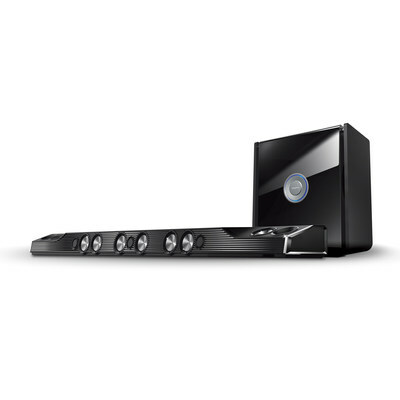 It incorporates Dolby Atmos® surround technology and now includes Creative's all-new SuperWide X-Fi™ technology to bring you the ultimate 15.2 3D audio experience – the best of both worlds in home theater and high-end audio. The Sonic Carrier delivers a mind-boggling 1000W RMS (2000W peak power) of brute power. The 600W RMS wireless subwoofer can punch so deep that listeners will literally feel chest-pounding bass. Powered by 8 processors, the Sonic Carrier is not only capable of high resolution audio playback; it also features an Ultra HD video engine that supports 4K 60fps video playback of local and online content. Featuring 3 distinct wireless technologies, the Sonic Carrier offers 2 separate Wi-Fi® solutions for audio and video streaming, Bluetooth®, and a zero latency wireless speaker-to-speaker link to up to 4 subwoofers. One would expect all these wizardries to come from a convoluted array of expensive systems. Instead, it is a beautiful sleek one piece system, without messy cables. Together with an exquisite wireless subwoofer akin to designer furniture, the Sonic Carrier is truly a piece of art. "We have finally come to the end of a long and arduous journey. I'm glad that what started in early 2015 as a crazy idea and an impossible dream, has found numerous supporters who share the passion for this idea. And now, together with our supporters, we've made this dream come true," said Sim Wong Hoo, CEO of Creative Technology, Creator of Sound Blaster and Sonic Carrier. "Since we first unveiled the Sonic Carrier at CES 2016, I have driven the team to implement a whole slew of improvements. The biggest challenge was how to deliver the best high-end audio with small drivers in front of the TV. The drivers had to be small so that the system could be sleek and elegant. So we expanded the standard 7.1 system into a 15.2 system, with increased numbers of smaller drivers to deliver the big sound needed for a home cinema system; and with enough head room for a high-end audio system. We put in tons of processing power, in fact one DSP for each channel. Sonic Carrier upscales all stereo sources into 24-bit high-resolution and metamorphosizes them into a new kind of 15.2 stereo experience, which we call SuperWide X-Fi stereo." "SuperWide X-Fi does away with the rigid sweet spot requirement, delivering an expansive soundstage. You can now enjoy great audio from different parts of the room. In fact, this radical technology is truly a revelation to the senses. It transports you into a magical three-dimensional audio utopia beyond your imagination. This is the Audio of Tomorrow," added Sim Wong Hoo. The new subwoofer not only comes with two larger 10″ drivers, its power amplifiers' power is doubled from 300W to 600W RMS. This effectively produces four times the audio output compared to the original prototype. The subwoofer now also features an exciting designer look. The ID creates a perception of an inner module floating magically within an outer frame. An added elegant glowing backlight behind the unit's metallic badge is capable of transforming into an amazing 16-million color light show if desired. The subwoofer also comes in an optional super premium high-gloss piano finish. This finishing involves applying 8 layers of coating where each layer is painstakingly hand-polished, spray-coated, and baked overnight. This arduous process is repeated 8 times over a period of 8 days to achieve an enviable high-gloss piano finish. The original 0.75″ tweeter was replaced by an in-house custom-designed 1" tweeter. This improved tweeter features a bespoke 1″ coated aluminum alloy dome, optimally matched to a soft rubber surround. As compared with the original 0.75″ tweeter, the slightly larger dome of the new 1″ tweeter provides 80% more radiating surface area for cleaner, more effortless lower treble reproduction. This improves distortion characteristics in the lower treble, while retaining extended high-frequency response and transparency. The new tweeter also features low viscosity magnetic fluid cooling for improved power handling, as well as a more powerful motor system. After many iterations of re-engineering, the midbass drivers have been upgraded and improved significantly; especially with the goal of meeting the onerous demands of high-end audio. The original side-firing mid-bass drivers were replaced with 2.25" full-range drivers which are custom-made with aluminum-alloy diaphragm and oversized 1″ voice coil. These new full-range drivers produce a wider side field dispersion pattern which helps to improve the immersiveness of the Dolby Atmos and 15.2 SuperWide X-Fi audio experience. The top-firing tweeter drivers and its housing have undergone extensive re-design in order to give a more than extraordinary audio experience in the height element, while actually maintaining the same physical height of the main unit. This re-design involved more than 30 design iterations on the tweeter housing, each tested and evaluated on 5 different types of tweeters. DTS:X is the latest technology from DTS and delivers immersive moving surround sound that now includes a height element. It is also a superset of all relevant preceding DTS releases. This will allow users to experience the latest surround sound technology content supported by the format with Sonic Carrier. To find out more about the X-Fi Sonic Carrier, go to: www.soniccarrier.com. Download a 28 page X-Fi Sonic Carrier brochure at www.soniccarrier.com/brochure. To learn more about the improvements to the X-Fi Sonic Carrier, go to: www.creative.com/soniccarrier/blog. Creative is a worldwide leader in digital entertainment products. Famous for its Sound Blaster® sound cards and for launching the multimedia revolution, Creative is now driving digital entertainment with cutting-edge audio solutions which include premium wireless speakers, wireless headphones, and powerful audiophile-grade amplifiers and digital audio converters. Today, Creative re-invents the Sound Blaster, which has a user base of over 400 million, with its ground-breaking Sound Blaster Roar and Sound Blaster X7 that aim at the new mobile networked generation by bridging the worlds of the computer, smartphones, and tablets. Creative's proprietary technologies, innovative hardware, applications and services leverage the Internet, enabling consumers to experience high-quality digital entertainment – anytime, anywhere. This announcement relates to products launched in the United States. Availability is subject to change without notice and may differ elsewhere in the world according to local factors and requirements. Creative, the Creative logo, X-Fi, the X-Fi logo, Sonic Carrier, SuperWide X-Fi and Sound Blaster are trademarks or registered trademarks of Creative Technology Ltd in the United States and/or other countries. Dolby Atmos is a registered trademark of Dolby Laboratories. All other trademarks are the property of their respective owners.